In 32 years of pastoring, I have offered brides and grooms (mainly brides) the option of using Sunday morning worship as a venue for their wedding, including the vows and rings as a part of worship. All couples have declined the offer for obvious reasons: more components, more special music, guest participants, invited guest only, special decorations, etc. It all makes sense. Then, at a wedding I co-officiated at in Minnesota, the pastor of the church took time to explain the Protestant view that wedding is not a sacrament (though it is sacramental) but worship. We gather around the risen Lord in his church to make vows and witness love and obedience. Today those factors came together when the bride and groom were not only willing but excited to have their wedding as a part of Sunday morning worship. I preached the lectionary text (John 10:11-16 on the Good Shepherd) and at the end of the sermon I said that a couple wants to take steps of obedience to the Good Shepherd by making their vows in front of their worshiping community. 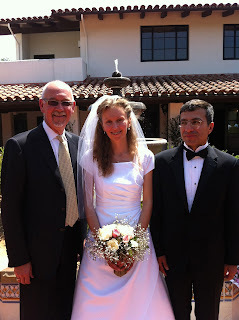 The bride came in on the arm of a friend and the groom made quick steps down to the front from a side aisle to meet her. I did the prologue, the declaration of consent, they came up to say their vows, exchanged rings and then the best man and matron of honor along with Jon Lemmond and Lisa Holmlund laid hands on them as I prayed and blessed them. They kissed and we introduced the new couple to loud applause. The reception was on the patio. They provided food and bread and humus. It was a fun, fun day! I'm preaching on a familiar text Sunday, John 10:11-16. It's the "I am" statement of Jesus where he calls himself the Good Shepherd. In the past, I focussed on his identity and what that means for us. But this time all the verbs jumped out at me: the gathering shepherd, the bailing hired hand and the scattering wolf. And me? I'm a sheep. I'm a sheep in movement. The question this text asks me is what drive my movement: the call of the shepherd, the disappointment with the hired hand or the fear of the wolf? This was the outline for Confirmation last Wednesday....church history. 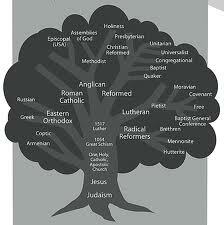 The big trunk is the church from Jesus to the Reformation. Would 12-13 year old students be interested in this? Yes!They gobbled it up and we ran out of time. Frequently during the evening there would be an burst of "Ohh! That's where that came from!" And at the end of the evening when I asked them what they learned, one young girl said, "It taught me that we are lot more alike than different...we're all Christians!" The church is so easy to bash and church history is so easy to ignore as a waste of time. As a pastor for 32 years within one denomination, I have seen (and caused) my share of blunders. I know it is organizationally inefficient, tediously slow to make decisions, overly homogenous and unfriendly to strangers, slow to adapt to change (if not hostile and resistant), and full of sinners, hypocrites and liars. Our history is speckled and spotted with one sin after another. I know it. I'm an insider and the son of a pastor, brother to a pastor, and son-in-law to a pastor. But the church is the plan and church history is not a tragic error, needing to be forgotten because this generation will make it all straight. If Jesus is truly present where two or three are gathered, then we owe it to Jesus to discover how he worked last year, last decade, last century, or last millennium with the two or three gathered in his name. Gary & Mary Lou Sander will be sharing the Good News tomorrow on Covenant Missions in Colombia and how God continues to break down the walls that divide us. He approached me with a cup of coffee and his big grin. "Hey, congratulations!" he said. We went to seminary together and did Clinical Pastoral Education (CPE) together as well. While not regularly in communication, we see each other at these larger gatherings of churches. "Congratulations for what?" I asked. "For crossing the 30 year mark of ordination." he said. "That's a big deal!" Well, he was of the same cohort, so he was celebrating his 31st with me. What does it mean to be doing something over 30 years? I know what it means in my marriage. It means we are tuned in to each other in ways I cannot imagine. It means our likes and dislikes merge and converge with a dance-like delight. 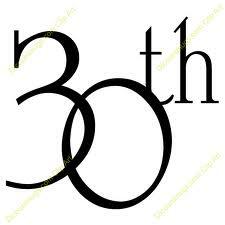 But 31 years of ordained ministry! Wow! I think about the church I grew up in and the church I trained for. I think about the shifts and trends in our culture and within the church and families. I'm awed by the continual power of God's word for my life and in the worship life of a congregation. I'm humbled by both how far I've come and how far I still need to grow and mature. Maybe now I'm slower to take that critical shot at a leader or movement and quicker to repent of hurting someone and going into prayer. I'm awed at being allowed to be a pastor of a wonderful parish. And I can't wait to get in the car after the meetings are done today and go home to Martha...and the church. The Gospel lesson is John 20:19-31. The disciples are in the upper room with the doors locked for fear of the Jews and everyone else. Jesus enters and says "Peace to you" three times. I get that. Fear locks all sorts of doors and Jesus' peace drives out all fear. The question I rumble around with is this: why do I keep gravitating to fear and abandoning the peace Jesus offers? A very conservative friend gave me this book after we both heard the author, Jonathan Haidt, interviewed on NPR. We are familiar with and tired of the complaint of the lack of civility in public discourse and, especially in politics. The author is a moral psychologist, liberal, atheist, Jewish person who says that classic liberals (like himself) don't get it...and neither do conservatives. I'll let you fill in the names of your poster child "Liberals" and "Conservatives." This 318 page book is divided into three fascinating (and challenging) parts. Part one is devoted to the first principle of moral psychology: intuitions come first, strategic reasoning second. By this Haidt makes an argument that we are not all that rational. We have strong and immediate opinions, emotions, and intuitions about things that we let our reason post hoc back up. He sites many brain and genetic studies to demonstrate his point. Part two is devoted to the second principle of moral psychology: there's more to morality than harm and fairness. This is where the book get really interesting. Haidt posits that we live in a world with six moral matrixes: care/harm, liberty/oppression, fairness/cheating, loyalty/betrayal, authority/subversion, and sanctity/degradation. Every person has their most beloved matrix and others fall into line, or are unimportant. Liberals and Conservatives, Haidt argues, don't understand the other's "sacred narratives." Part three is devoted to the principle that morality binds and blinds. We bind together with those we agree with as in a "hive" and we act as selfish individuals as a "chimp" in what Haidt describes as "Homo duplex", our two sides. The tighter our "hives" the more we see others who differ with us a enemies. The answer? Become a friend with someone you really disagree with philosophically or theologically or politically. Learn their story even though you do not agree. 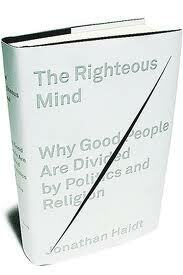 Haidt does not urge for moral or spiritual capitulation, but for conversation and friendship. Goodness knows, we need it. It's a quiet Monday morning. I'm still in my robe and pj's nursing a 3rd cup of coffee. The events of the Easter weekend (Maundy Thursday, Good Friday, Easter) roared through my mind/heart/body as they have for 32 years. The three services, all distinctly different and often with different attendees, both energize and sap pastors. The preparations for a Thursday meal, eucharist and foot washing requires team logistics. This year, even though the numbers were smaller (32) the energy was rich and tender. Good Friday was a battle for starkness and simplicity: voices, images, songs and darkness. Then Easter Sunday was high energy punch with brass, kids everywhere, egg hunt, food, family gathering, over 500 in attendance...and the baptism of my granddaughter. So family came (Liz & Jeff the week earlier, stopping by San Diego to see Elise), then Isaac, Anna, Elise and Lily (granddog) and Luke & Kelly. It was a weird and delightful realization of having all children with spouses present. And having Elise in my arms was nothing short of electric. This precious little child held the center of the Johnson family for the whole weekend. Her cries, naps, and alert moments were the dominant signals that defined when we would or would not do things. And then being allowed to baptize my first grandchild was one of the highest privileges I have had as a pastor/father. I officiated at the weddings of all three couples. That is indeed an honor. 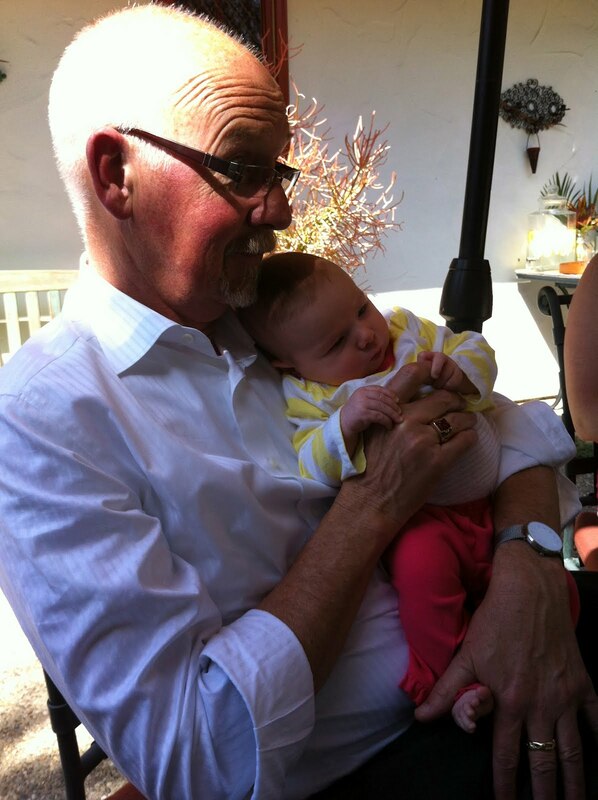 But then to hold this little life in my hands at the font and to declare the baptismal promise over...whew! The picture above captures it all for me. The altar-piece tells the story of Mark 16:1-8. The cross and tomb are empty. The word, nested in the uplifting arrangement of lilies and branches points to the promise: "He is risen. He is not here! He has gone ahead of you into Galilee...just as he said." Easter hinges on the truth of that promise to the disciples then...and now! Easter gets more and more squeezed. Because the percentage of Christians in our society declines, programs and decision are made without serious regard for these three days called the "Triduum." The what-uuum? Maundy Thursday, Good Friday and Easter. There are now sports tournaments over the Easter weekend, art openings at Christian colleges on Maundy Thursday, plays on Good Friday, and early shopping on Easter Sunday. I feel the compression of these three days into one. Maybe we could begin Easter morning with communion, read about the crucifixion during Sunday School and celebrate the resurrection at 11:00 a.m. and make it kind of one-stop-shopping. In February when we offered a modified Ignatian Prayer Retreat for 6.5 hours, we who were in leadership wondered if anyone would come. Would anyone find 6.5 hours in their already jammed and over-scheduled days to devote to prayer. To our surprise, 11 turned into 25 which turned into 32. The comments keep coming back to me how hungry these members were for protected and relaxed time with God. The 3 Days of the Triduum offer that same kind of slower pace into Easter. So tonight we will gather at 6:00 p.m. for a dinner together around tables and the celebrate both communion and foot washing in a slow and relaxed pace. Friday night will be a gathering in the stripped sanctuary with nothing visible except for candles and a schrouded cross as we listen to the arrest, trial and crucifixion narrative from the Gospel of John. Then Easter will be ripe and ready on Sunday morning. Fr. Greg Boyle at M-4 tonight!